Collagen is a protein made up of amino acids that are found in the human body. Here's a look at what collagen is and how it is used in the body. Like all proteins, collagen consists of amino acids, organic molecules made from carbon, hydrogen, and oxygen. "Collagen" actually is a family of proteins rather than one specific protein, plus it is a complex molecule, so you won't see a simple chemical structure for it. Usually, you'll see diagrams showing collagen as a fiber. It is the most common protein in humans and other mammals, making up 25% to 35% of the total protein content of your body. Fibroblasts are the cells that most commonly produce collagen. The word collagen comes from the Greek word kolla, which means "glue". 80-90% of collagen in the human body consists of types I, II, and III collagen, although at least 16 different forms of the protein are known. Gram for gram, type I collagen is stronger than steel! Collagen used for medical purposes need not be human collagen. The protein may also be obtained from pigs, cattle, and sheep. Collagen may be applied to wounds to serve as a scaffold on which new cells can form, thus improving healing. Because collagen is such a large protein, it is not absorbed through the skin. Topical products that contain collagen can't actually deliver any of it below the skin surface to replenish damaged or aging tissue. However, topical vitamin A and related compounds do promote collagen production. 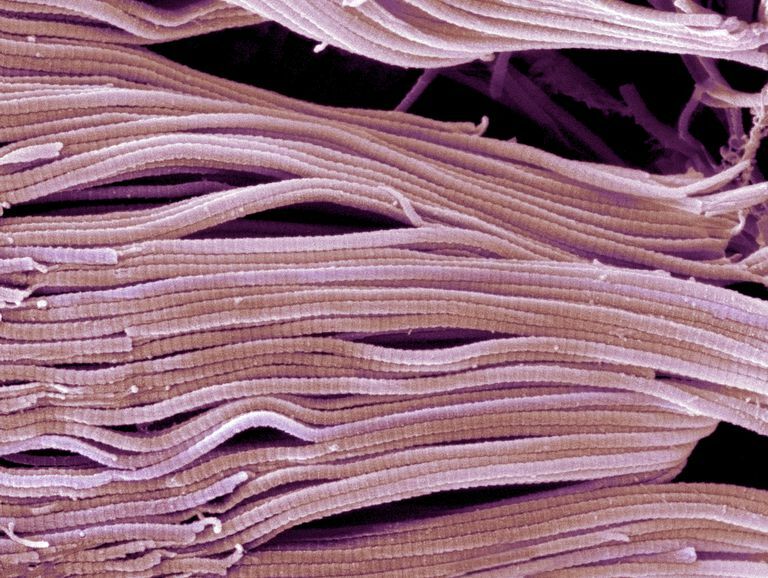 Collagen fibers support body tissues, plus collagen is a major component of the extracellular matrix that supports cells. Collagen and keratin give the skin its strength, waterproofing, and elasticity. Loss of collagen is a cause of wrinkles. Collagen production declines with age, plus the protein can be damaged by smoking, sunlight, and other forms of oxidative stress. Connective tissue consists primarily of collagen. Collagen forms fibrils that provide the structure for fibrous tissue, such as ligaments, tendons, and skin. Collagen also is found in cartilage, bone, blood vessels, the cornea of the eye, intervertebral discs, muscles, and the gastrointestinal tract. Collagen-based animal glues may be made by boiling the skin and sinews of animals. Collagen is one of the proteins that give strength and flexibility to animal hides and leather. Collagen is used in cosmetic treatments and burn surgery. Some sausage casings are made from this protein. Collagen is used to produce gelatin. Gelatin is hydrolyzed collagen. It is used in gelatin desserts (e.g., Jell-O) and marshmallows. In addition to being a key component of the human body, collagen is an ingredient commonly found in food. Gelatin relies on collagen to "set". In fact, gelatin can even be made using human collagen. However, certain chemicals can interfere with collagen cross-linking. For example, fresh pineapple can ruin Jell-O. Because collagen is an animal protein, there's some disagreement over whether foods made with collagen, such as marshmallows and gelatin, are considered vegetarian.